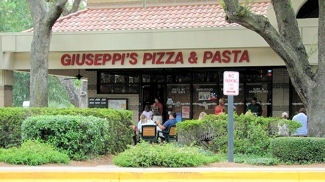 Giuseppi's is the best of Hilton Head Island restaurants serving pizza and is worth the wait! Giuseppis Pizza restaurant is mid-island in The Plaza at Shelter Cove. There are lots of shade trees and benches outside to make your wait more comfortable. We usually order a cold drink from the bar and just relax outside, the wait time goes by fast with so many people to watch unlike some Hilton Head restaurants. Giuseppi's insists on the freshest and most authentic ingredients, they don't cut corners at this Hilton Head restaurant. The sauce is made fresh from California tomatoes, the dough is made daily and the best quality Italian cheeses top their pizzas. Giuseppi's Pizza wants to be your favorite neighborhood pizza restaurant; our hope is you enjoy the food and atmosphere as much as we have even if you're not a Pittsburgh Steelers fan. Take a walk down to Outside Hilton Head; they have all sorts of tours and excursions you can book. They also sell hammocks, kayaks and outdoor apparel. If you want to take a Hilton Head Kayaking Trip, Dolphin Eco Cruise, Daufuskie Island Excursion or a Hilton Head Deep Sea Fishing Charter this is the place to book it. We have never been disappointed with Outside Hilton Head nor the best pizza and pasta of Hilton Head restaurants - Giuseppi's!